The Temple of Heaven is located in Dongcheng, Beijing. The Temple of Heaven was built between 1406 and 1420. The Temple of Heaven is a group of religious and imperial building located in Dongcheng, Beijing, China. Emperors of the Qing and Ming dynasty visited the complex twice a year to pray to the heavens for good harvest. The temple was designated as a UNESCO World Heritage Site in 1998. The temple was built for emperors to pray and make sacrifices on behalf of their empire. The temple was built from 1406 to 1420 by Emperor Yongle of the Ming Dynasty, who also built the Forbidden City in Beijing. 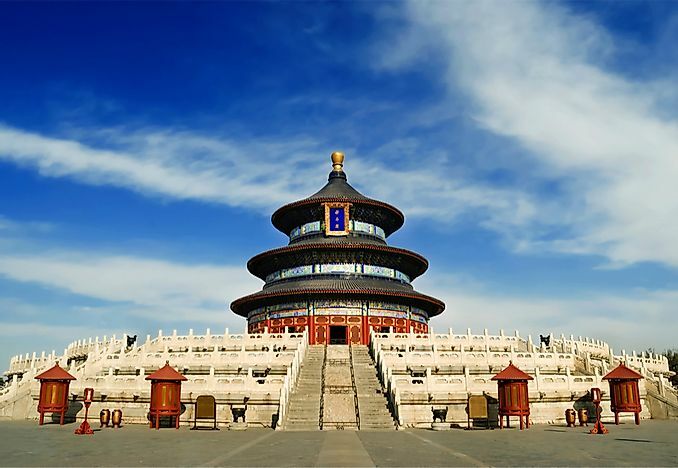 In the 16th century, the Jiajing Emperor extended the temple and renamed it the Temple of Heaven. Jiajing is also credited with building three other famous temples in Beijing: Temple of Moon, Temple of Sun, and Temple of Earth. The Qianlong Emperor renovated the Temple of Heaven during his rule in the 18th century, and because the economy had become strained, it was the temple's last renovation during the imperial period. Wars in China during the 1900s damaged the temple and various artifacts were stolen. The temple was converted into a park and made open to the public in 1918. The entire temple complex, including the surrounding park, has an area of about 660 acres. The temple complex alone covers an area of 1.05 square miles and has three groups of construction. The Hall of Prayer for Good Harvests is a circular building with a triple-gabled roof. The building has a diameter of 118.11 feet and a height of 124.67 feet. The hall has a three-level marble stone base, while the building is made of wood. The present building was rebuilt after the original building was destroyed by a fire caused by lightning in 1989. The Emperor prayed here. The Imperial Vault of Heaven is a circular building with a single gable roof and a single level base made of marble stone. It looks like a smaller version of the Hall of Prayer for Good Harvests, and is situated south of the hall. The building is surrounded by a circular wall, named the Echo Wall, which can relay sounds over vast distances. The Vermillion Steps Bridge, which his 1,180 feet long, links the Hall of Prayer for Good Harvests to the Imperial Vault of Heaven. The Circular Mound Altar is an empty round podium set on three levels made of marble stone. The levels are each adorned with carved dragons. The mound has a perimeter of 1,751.97 feet and is 17 feet high, and it is located south of the Imperial Vault of Heaven. The altar's center is composed of a circular slate, known as the Heart of Heaven, which was used by Emperors to pray for good weather. The altar was constructed in 1530, and was expanded in 1749. The temple complex has several features that symbolize the connection between Heaven and Earth. The dark blue roof on the temple’s buildings is symbolic of heaven. The park is open to visitors daily between 6:00 am and 10:00 pm. The park has four gates, which are accessible by public transport, and visitors are charged an entry fee.